Texas’ 2019 recruiting class grew to 24 members when five-star athlete Bru McCoy transferred from USC to Texas. The Longhorns signed 22 pledges in the early signing period and then McCoy in January. 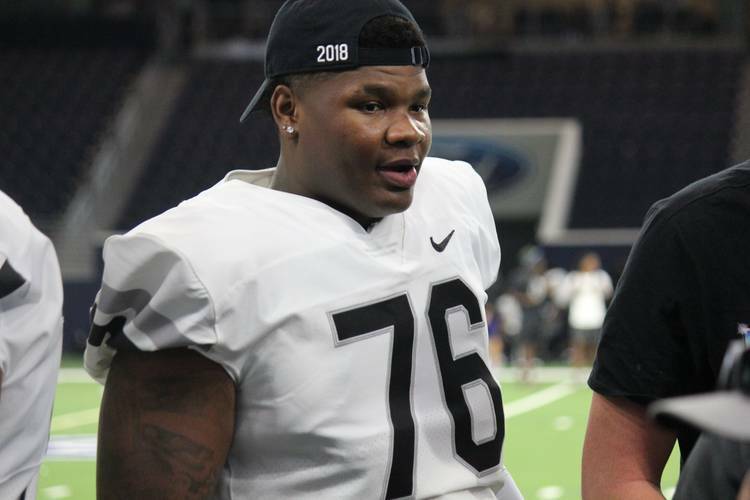 Tom Herman hopes the only remaining unsigned member of the class — four-star offensive tackle Javonnne Shepherd — makes it official on national signing day and becomes a Longhorn. Shepherd is a 6-6, 327-pound offensive tackle out of Houston North Forest, which is in east Houston. He’s the No. 33-ranked player on the 2019 Fab 55 and a national top-350 prospect who is still being courted by Texas A&M, Alabama and Georgia. Uncertainty has surrounded his commitment status since he chose not to sign in December, but Shepherd remained committed and is set to take his official visit to Austin this weekend. No one knows for sure what Shepherd will do — even Shepherd. The visit to Austin is important for coach Herb Hand and the UT staff, who signed just two offensive linemen in the early period. Shepherd is a freakish athlete for a young man well over 300 pounds. He can run around like a tight end, as he did this summer at an end-of-summer camp at Texas. As camp closed in June, there was one player on the field catching passes from the coaching staff: Shepherd. There might not be a harder transition in football than going from blocking high schoolers to grown college players. That’s even more true for Shepherd, who plays Class 4A football. He’s not used to blocking players as physical and athletic as he is, and he’ll need time to shape his body and learn the nuances of playing college offensive line before he’s ready to compete for the starting spot at left or right tackle. Shepherd isn’t a polished product like UT signee Tyler Johnson or future Aggie Kenyon Green. He might possess more upside than either of those prospects, however, because of his frame and natural athleticism. He’s a true boom-or-bust offensive line prospect that is worth the risk because of the all-conference potential at a hard position to recruit. The 2018 class was run by Herman. Jimbo Fisher and Texas A&M rebounded nicely with the 2019 class and will finish with one of the program’s best recruiting classes in decades. The 2020 class will produce fireworks between the two programs as they each jockey for position as the state’s ideal destination. In some ways, Shepherd is the first indicator of how the 2020 class unfolds. If Texas holds onto Shepherd despite a monumental push for the past several months, it proves Texas can win against the shiny new toy that Fisher is selling in the SEC. If A&M flips Shepherd, it proves that the Aggies are here to stay as a recruiting force, which hasn’t exactly been true inside the state this decade. Texas’ recruiting class sits at No. 3 in the nation, just ahead of recruiting rivals Oklahoma and Texas A&M. That would change if Shepherd flipped to A&M, as the Aggies would move up to No. 3. Shepherd is not only a good player with tremendous upside, but also represents bragging rights for the Longhorns and the Aggies. It’s as simple as this, really: The in-state program that signs Shepherd next Wednesday wins the 2019 class and for the state and carries early recruiting momentum into 2020.